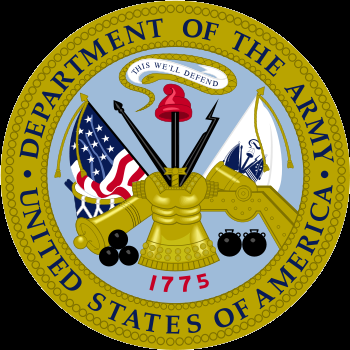 CSM Michael J. Perry III entered the United States Army on 10 August 1992 as a Food Service Specialist, MOS 94B. He completed Basic Combat Training and Advanced Individual Training at Fort Jackson, South Carolina. 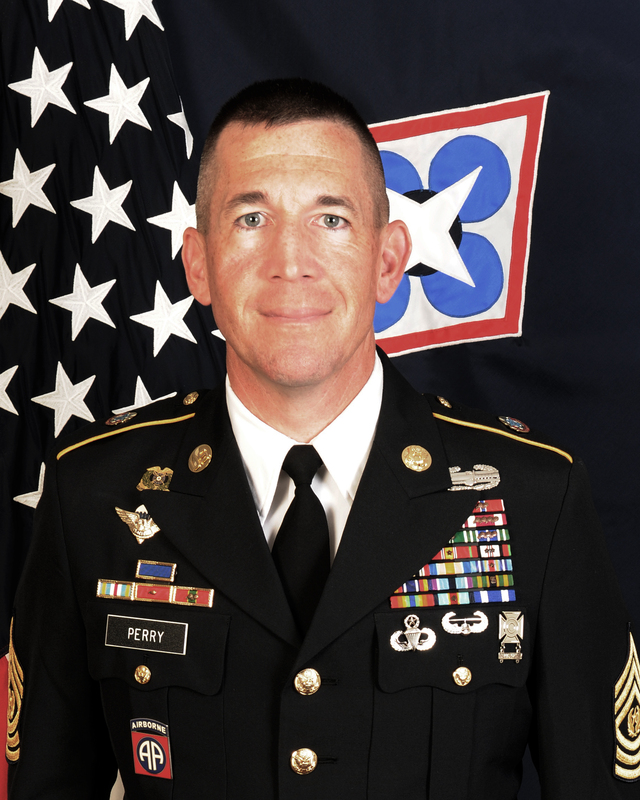 CSM Perry’s most recent assignment was serving as the Sustainment Directorate Sergeant Major for CJTF-OIR. CSM Perry’s assignments include: Brigade CSM for the 101st Airborne Division (Air Assault) Sustainment Brigade, 101st Airborne Division, Fort Campbell, KY; Battalion CSM for the 264th Combat Sustainment Support Battalion, 3d Expeditionary Sustainment Command, Fort Bragg, North Carolina; Squadron Command Sergeant Major for Regimental Support Squadron, 2d Cavalry Regiment in Vilseck, Germany; Chief Food Operations Management NCO for III Corps and Fort Hood, Texas; United States Army Sergeant’s Major Academy, Fort Bliss, Texas; 1st Brigade Combat Team, Fort Bragg, North Carolina; First Sergeant, Alpha Company, 782nd Brigade Support Battalion, 4th Brigade Combat Team, Fort Bragg, North Carolina; First Sergeant, Headquarters and Alpha Company, 782nd Main Support Battalion, DISCOM, Fort Bragg, North Carolina; 1st Special Forces Operations Detachment (Delta Force), Fort Bragg, North Carolina; 3d Battalion, 505th Parachute Infantry Regiment, Fort Bragg, North Carolina, and 1st Battalion, 501st Parachute Infantry Regiment, Fort Richardson, Alaska. CSM Perry’s military schools and education includes the Basic Airborne Course, Air Assault Course, Static Line Jumpmaster Course, First Sergeant Course, Senior Enlisted Joint Professional Military Education (SEJPME 1 & 2) Course, CSM Development Course-Brigade and Battalion Level and the CSM Pre-Command Course. He has completed all Levels of the NCOPDS to include the Nominative Leader’s Course and is a graduate of the United States Army Sergeant’s Major Academy, Class 60. He has a Bachelor’s of Science Degree in Business Administration from Methodist College and an Associate of Arts Degree from the University of Alaska, Anchorage. CSM Perry is currently pursuing a MBA through Trident University International. CSM Perry’s awards and decorations include the Legion of Merit, Bronze Star Medal (2 OLC), Defense Meritorious Service Medal, Meritorious Service Medal (4 OLC), Joint Service Commendation Medal, Army Commendation Medal (3 OLC), Army Achievement Medal (3 OLC), Good Conduct Medal (8th Award), National Defense Service Medal (1 Bronze Star), Afghan Campaign Medal (2 Bronze Stars), Iraqi Campaign Medal (3 Bronze Stars), Inherent Resolve Campaign Medal, Global War on Terrorism Expeditionary Medal, Global War on Terrorism Service Medal, Humanitarian Service Medal, Noncommissioned Officer Professional Development Ribbon (Numeral 6), Army Service Ribbon, Overseas Service Ribbon (Numeral 4), NATO Medal-ISAF, Presidential Unit Citation, Joint Meritorious Unit Award (1 OLC), Meritorious Unit Citation (1 OLC), Army Superior Unit Award (2 OLC), Combat Action Badge, Air Assault Badge, Master Parachutist Badge, Combat Action Badge, the Venezuelan and Ukranian Parachutist Badges. He is also a member of the Distinguished Order of Saint Martin, the Order of Saint Maurice-Legionnaire and the Order of the Gold and Silver Spurs. CSM Perry has deployed three times in support of Operation Iraqi Freedom, twice in support of Operation Enduring Freedom, and once in support of Operation Inherent Resolve.